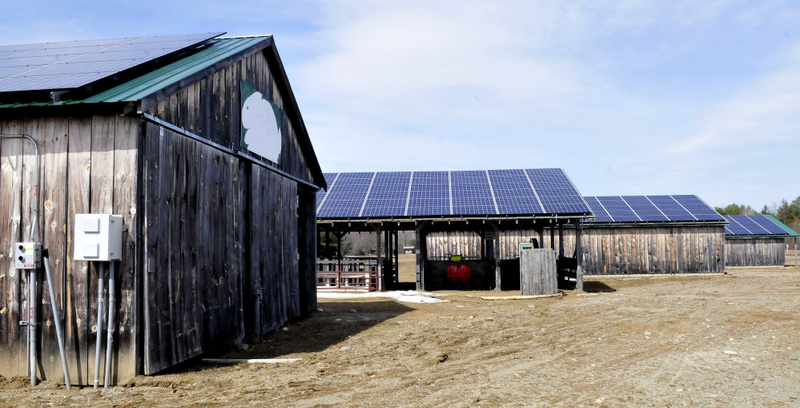 The Maine Organic Farmers and Gardeners Association's 300-panel array will offset the organization's fossil fuel consumption at the site of the Common Ground Country Fair. UNITY — If ever there was a day to unveil a new solar energy array, a bright, warm, sunny day after a long winter might be the ideal day. And that’s exactly what the oldest and largest state organic group in the country did on Monday. 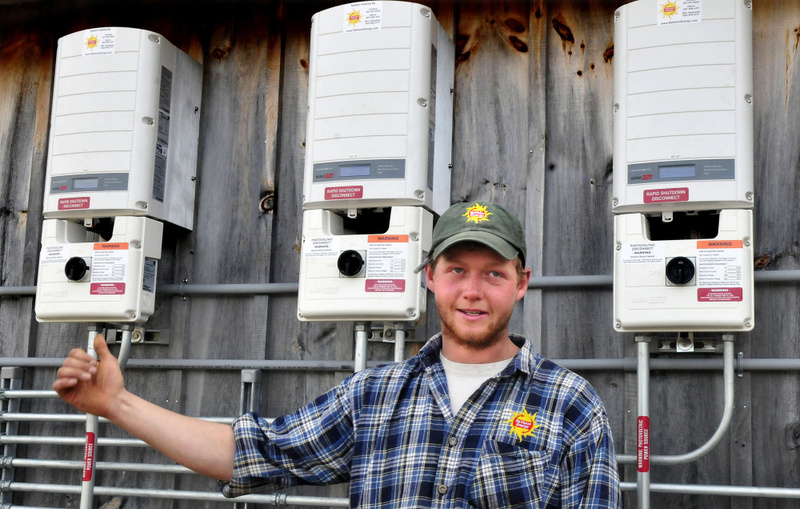 The Maine Organic Farmers and Gardeners Association effectively flipped the on-switch Monday for its new array at the Common Ground Education Center on Crosby Brook Road, where more than 300 panels are spread out over five barn roofs. Jason Tessier, MOFGA’s buildings and grounds director, said the 102-kilowatt array — along with all their other forms of renewable energy — will provide all their electricity and nearly offset their fossil fuel consumption. He said this will translate to nearly $20,000 a year in savings from fuel costs. “This makes us energy independent,” he said. The array is owned by ReVision Energy, and MOFGA has entered a power purchasing agreement to buy power from ReVision at a fixed cost. Though the agreement is for 30 years, the organization will have the ability to purchase the array outright from ReVision after seven years, which Tessier said they intend to do. MOFGA’s solar array isn’t quite as large as most commercial projects that typically involve thousands of panels, but it dwarfs most residential efforts. 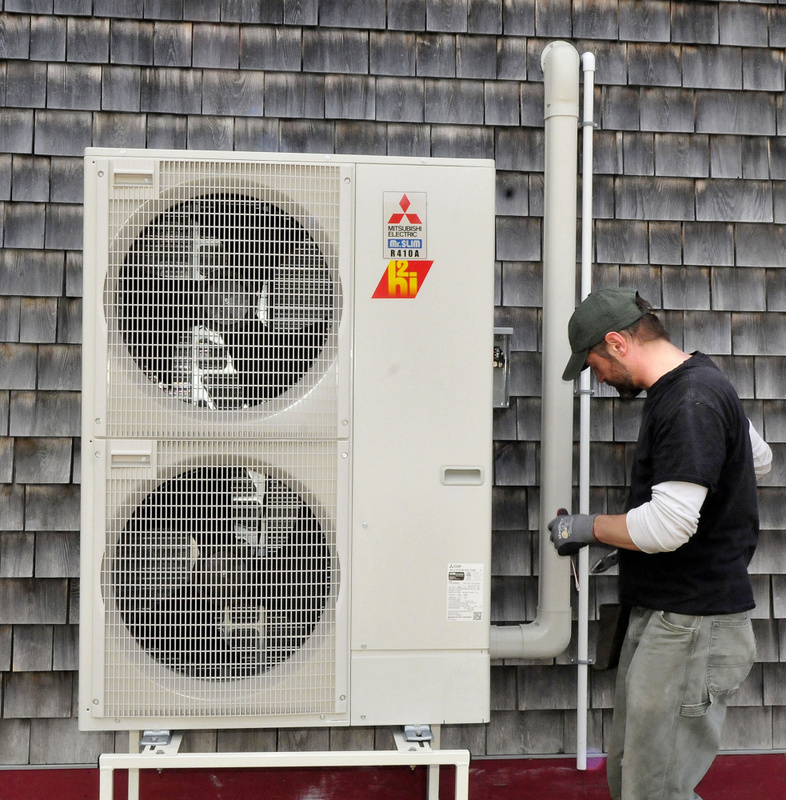 John Luft, branch manager for ReVision’s Liberty location, said an average residential installation is about 6 kilowatts, meaning this installation is the equivalent of 17 residences. Tessier said work on the installations began in December and wrapped up about a month ago. He said power technically began being produced in early March, but they only began tracking it Monday, prompting the announcement that the education center was now powered by solar. MOFGA is the site for the annual Common Ground Fair, which is held in September and attracts about 60,000 people over three days. Both Tessier and Luft said this will be an educational opportunity for people to see and learn about solar power and technology. “(People) will be able to see different ways energy can happen,” Luft said. Tessier said education is part of MOFGA’s mission, so having this opportunity was key. The organization sits on 300 acres of mixed farmland and forest, and the Common Ground Education Center provides year-round education services. The organization already had a number of small scale sources of renewable energy, ranging from heat pumps and a smaller solar photovoltaic array elsewhere on the campus. But this larger array achieves the goal of self-sufficiency. Luft said a project of this size with 311 panels is likely a $220,000 project. He said ReVision is a certified B-Corporation, which means it is a for-profit company certified by the nonprofit B Lab to meet rigorous standards of social and environmental performance, accountability and transparency. He said as part of that, it is their mission to try to get people away from using fossil fuels. “We couldn’t imagine a better partner (than MOFGA),” Luft said. Chris Trembly, project manager for ReVision, said the arrays convert direct current electricity into alternating current in order for it to be sent into the grid. DC energy is what you find in a battery, and AC is what comes out of the walls. “Actually putting the panels down was the quickest part of the job,” Trembly said. Tessier said he had been working on getting this project off the ground for a handful of years, and his predecessor had also been working on it. “It’s been at least a two-year process to where we could do it,” he said. He said when the time comes, they will do a fundraising campaign to purchase the array. 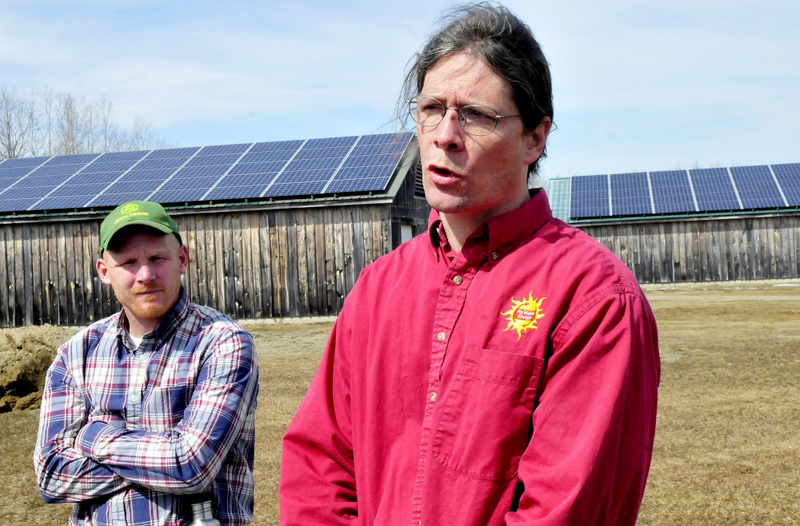 Luft said MOFGA had been “dabbling in solar for years,” and ReVision has partnered with them in the past. He said the benefits to having the solar panels are great, saying there is a 25-year warranty on the array and panels usually have a 40-year lifespan. He said with no moving parts, the panels just sit there and make electricity. “It’s set it and forget it,” he said.